I wasn't going to share about this, simply because I didn't want it to come across "sale-sy". But this is just too good to keep to myself. $5 Amazon cards are nice, but SIXTY DOLLARS in gift cards to the Home Depot is a pretty big deal (and significant savings for our budget!). Swagbucks is a website that you can use in so.many.ways. I started off by using it exclusively as a search engine. Instead of going to google, I went to Swagbucks, searched, and about every 5-10 searches I would get points. Typically 100 points=$1, 500 points=$5, etc. I follow Money Saving Mom pretty closely and she mentioned Swagbucks in her almost daily live Facebook videos a few times one week. I was like "I need to go see if I have any points in my account!" and I kid you not that same week I got an email saying that I was going to lose my points if I didn't login. Subtle hints? So I got back into the swing of searching, doing surveys here and there, using my email to sign up for things (only then to promptly unsubscribe). And pretty effortlessly I earned a $15 Amazon card. I was hooked back! 1. 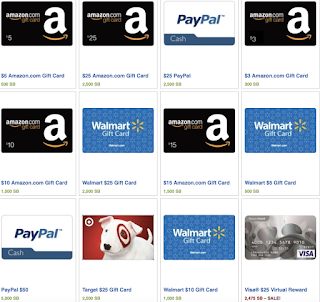 Shopping: much like the website ebates, I can go through the Swagbucks website before heading to other sites on the internet. For instance, when I shop online at Target.com I will first come to Swagbucks, click on the "Shop" link, and then click on "Shop at Target". 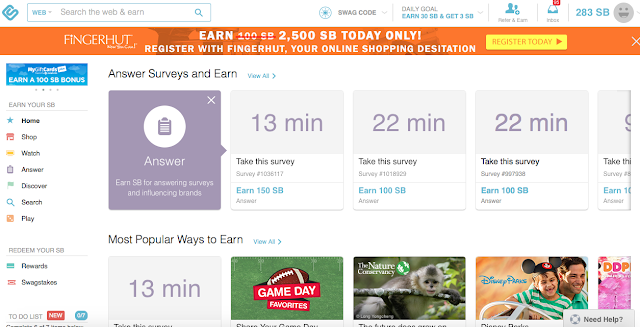 By simply doing that one extra step I can earn an extra 1-7 Swagbucks on every dollar I spend. Which when you are spending $50+ that is significant! They switch up the amount of what you earn every so often so it pays to check it out! Sometime it's 2 swagbucks, and other times it's seven! 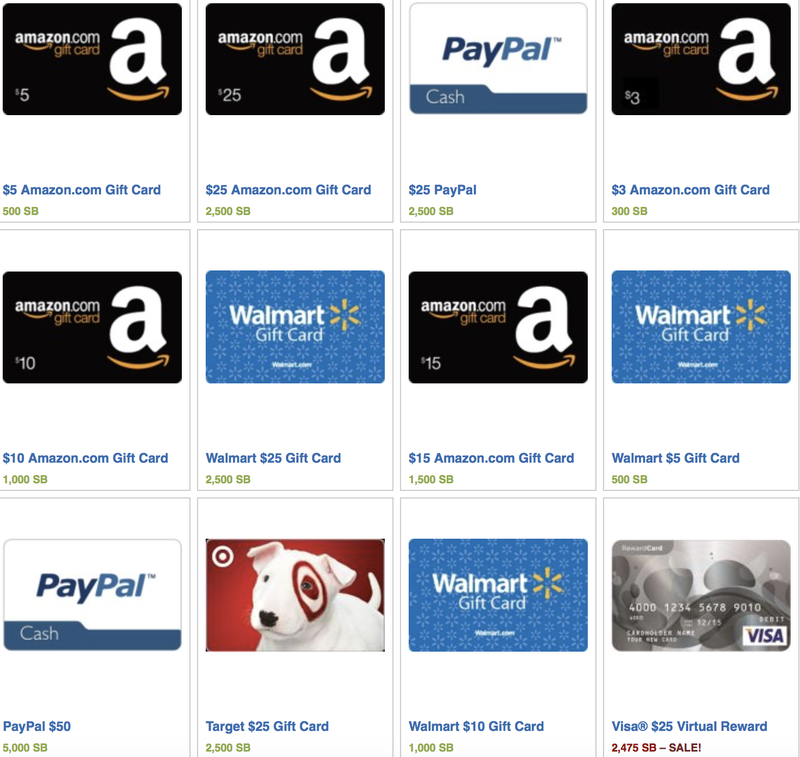 I currently have 800 swagbucks pending (they clear after 30 days) from items I have purchased for my shop! 2. Watch: these are short videos that really don't mean anything. It's not the most effective way to earn, but when I am working on the computer it really takes no effort to click on them and have them playing in the background. You usually earn 2 swagbucks for this. 4. Discover: probably my favorite way to earn! This is where they offer special offers and for no or very minimal cost you can quickly rack up the swagbucks. I went back and looked through my earnings this past month to see what earned me the most. I snagged a 3 month trial of Audible for $5 and then 1600 swagbucks. So they basically paid me $11 to listen to 3 audiobooks. #winning. Also, I signed up for Birchbox for 1 month. It costs me $10 (which is the typical monthly price) but I received 2,000 swagbucks for this. So while it did cost me, it immediately made up for itself. Especially since I had just cancelled Birchbox a month ago and it was something I was already budgeting. I also received 3,000 swagbucks for signing up for Home Chef. Much like Hello Fresh and Blue Apron, it is a meal delivery service that delivers fresh ingredients to our home. We love this service but it's too expensive for our budget to get every month. I paid $19 (from our food budget) to receive 2 meals delivered to our door. 3,000 swagbucks equals $30! So I easily made $11 and feel that $10 per meal/ $5 per serving is a fair price for fresh food delivered. The trick to all of this is to CANCEL THE SERVICE before you are charged full price. I literally write it on my calendar to cancel about a week before we'll be charged. SO far, for us it has been completely worth it! Also not everything on Discover is to pay for. You can get 50 swagbucks for entering your email to a recipe mailing list. I got 100 swagbucks for signing up for information about a Disney vacation. If it's not something you are interested in, simply unsubscribe from the emails. 5. 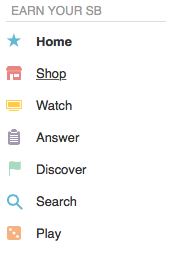 Search: I metioned this before but I use Swagbucks as a search engine. 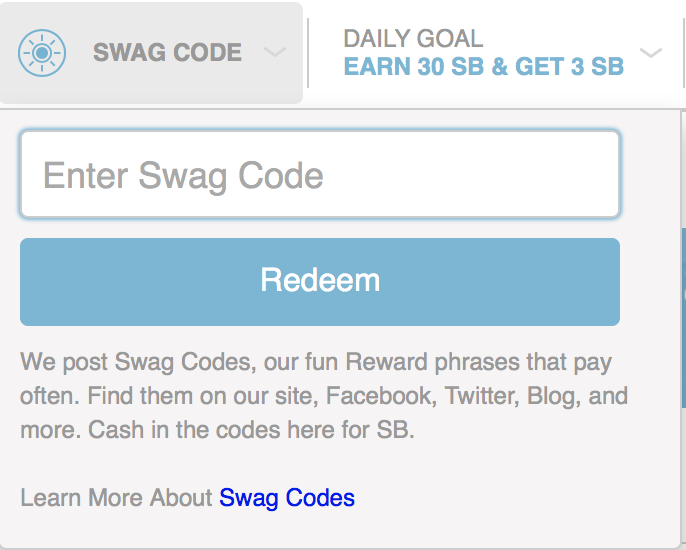 After a few searches you'll simply be awarded between 4-10 swagbucks just for searching! It really is easy! 6. Play: There is a game section where you can sign up to play games, and also enter sweepstakes. I haven't really gotten into this part of the site, so I really don't have much to add about it! 7. Swagcodes: Swagcodes are simple codes that they put out that when entered in time, will give you between 1-4 swagbucks per time. I also have push notifications set up on my phone so I am instantly alerted when they come in! So for this code I simply went to the Facebook page, copy and pasted the code in the box, and I got my swagbucks! Easy! Redeeming Swagbucks is the most fun part! Here is a sampling of some gift cards available. From my experience, Amazon pays out the most quickly. I grabbed the Target card about a week ago and I am still waiting on confirmation of it. Home Depot took about 10 days to clear, but it is just like an online gift card when it clears! Easy! I am using the Home Depot card for a room overhaul for the kids! I can't wait to share with you what I am able to get using my swagbucks cards! Don't hesitate to ask if you have questions! If this is something you think you want to do, sign up HERE. *contains affiliate links. Affiliate links are a win win. 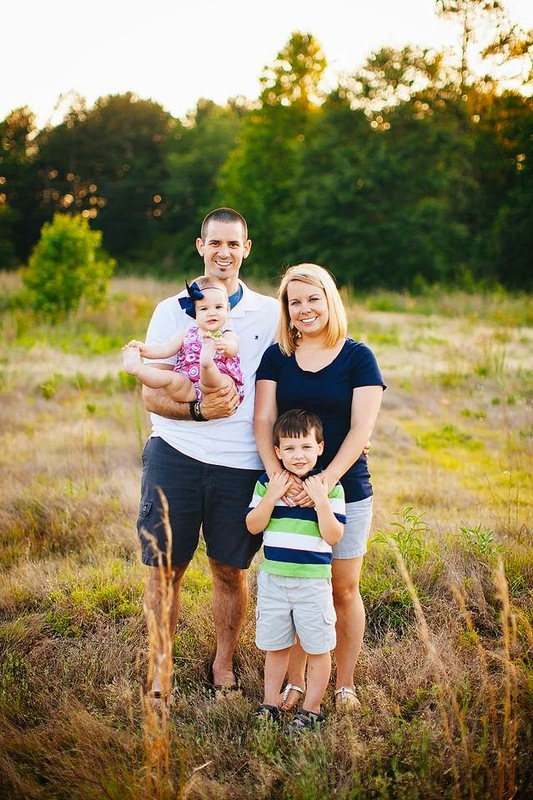 They provide a direct link to the products I love, and they help support the blog! Read my disclosures here.